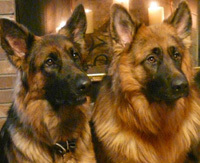 © 2007-present GSDcoats.com.® All Rights Reserved. Plan on bringing your pup home when you can spend a few days with him or her. This will be invaluable for the two of you to build a trust and need for each other .The pup has just been abandoned by mom and there are no sounds of siblings nearby for reassurance. The first thing I suggest is some soothing music At night an old fashioned wind up alarm clock that even ticks like moms heartbeat, and a warm piece of towel or clothing that pup can cuddle with I usually suggest the bathroom or laundry room for the first couple of nights I compare it to bringing home any newborn. Soft nightlights can work wonders as well. Pups do eat everything in site and can get loose bowels. If this is a mild case we generally don't worry about it.Occasionally we have given Pepto bismol and Pedialight. The electrolytes in it is great. If there is blood in the stool I suggest a Dr. visit right away. Again I am not a doctor just a grandma with old remedies. In other words heed the doctor words first. I Like having a crate. My preference is a wire one that I throw a light sheet over so the pup has privacy and I have a life. I refer to the crate as a den where the pup learns a safe place of his/her own. Any crate is better than no crate at all. Next I believe in puppy toys . Pups will want to explore and a creative classroom is a great environment since pups need to chew safely . Baby teeth will fall out and the adult teeth will come in later. I recommend the toys you can freeze to get some gum relief for the pup at this stage. Yes, I did say classroom. Your pup is ready to learn from the time you first held him to the time you let him know that outside is the potty .We start with food, try calling you new pup and when she recognizes her name she gets a reward. Soon you can teach the sit-down and other tricks in a matter of weeks. Just remember this is pre school not college. The key to teaching is make it short and sweet (yummy) . Later on (when your pup is 3 to 6 mos. old) you can go to a clicker or voice or whatever training method works for you. The main advice I can give you in training is repetition. Be cosistant do it over and over and don't keep changing things to confuse the pup. Designate a principle trainer and guides too many teachers with the best intentions can make anyone dizzy. You will see what suits your lifestyle. I feed non grain foods and I do supplements with natural vitamins. I suggest you take pup to the doctor within 72 hrs for his first physical. With the vets blessings I would heed the warning to be a protective parent and guard your dog from stray kids and dogs. Parvo is nasty and dogs can catch it anywhere. A clean pup area where they eat and play is a pound of prevention. Be protective around other dogs. Immunization is a hot topic but all agree that mom's milk only immunizes them for only a short period and then it is up to you to decide when and how often you immunize. 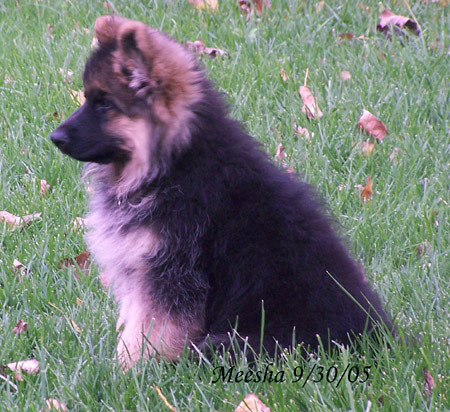 A Pup is a wonderful friend and companion and the best recipe for any new GSD pup is a lot of LOVE. Prince Valiant as a puppy see video here.